By definition, mammals are vertebrates, which means that all mammals have an internal skeleton that supports the body. This structure is characteristically made up of over 200 bones and supports muscles and ligaments throughout the body. Although the number of bones vary slightly in mammals, the structure and placement follow a basic plan. The skeletal system of mammals is divided into axial and appendicular portions. The axial skeleton is made up of the braincase, or cranium, which encloses the brain, and the backbone and ribs. The axial skeleton's main function is to protect the nervous system. The bones in the limbs and the girdles, which support the limb bones, make up the appendicular skeleton. Characteristically, the mammalian skeleton has a head at one end of the vertebral column, ribs supported by the vertebral column and four limbs. The vertebral column, or spinal column, is made up of small bones housing the spinal chord. In most mammals, the vertebrae is divided into five regions. The cervical spine supports the neck and head and is typically made up of seven vertebrae. The thoracic vertebrae makes up the spine in the upper back and the rib bones extends from it. There are between 12 to 15 thoracic vertebrae in the mammalian skeleton. The lumbar vertebrae makes up the rest of the spine in the lower back. There are normally four to seven lumbar vertebrae. The sacral vertebrae, usually three to five bones, are the bones that support the pelvic girdle and are often fused together. The last of the vertebral column is the caudal vertebrae. These small bones make up the tail and do not house the spinal chord. Mammals live in many habitats and require different characteristics for survival, but the basic plan of the mammalian skeleton has the same goal. 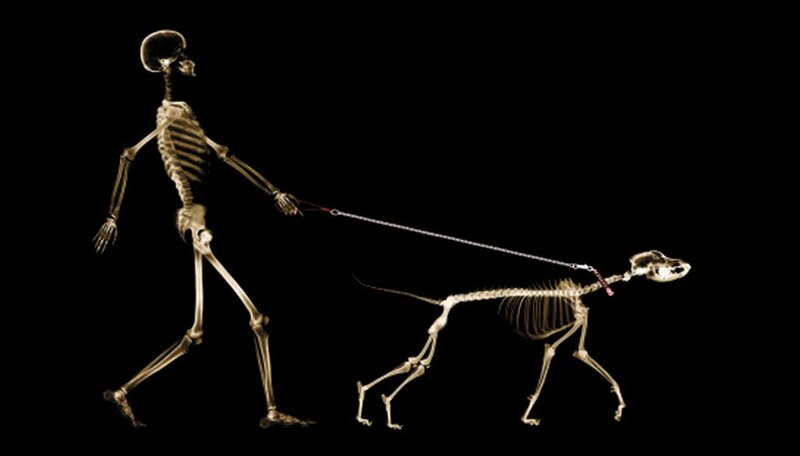 The bones of the skeleton are designed to support muscles and ligaments and protect organs. While some mammals don't have tails or hind limbs, there are very distinct characteristics in all mammals. The skull is divided into three parts, the braincase, the rostrum (snout and upper jaw), and the lower jaw. The rib bones create a cage to protect the heart and lungs. The girdles support the limbs. The bones supporting the limbs are the pelvic girdle and the pectoral girdle. The pelvic girdle is made up of innominate bones, two halves that contain three bones each. The bones in each half are the Ilium, Ischium and pubic bones. The pelvic girdle supports the hind limbs or legs. The pectoral girdle, which supports the fore limbs or arms, is made up of two different bones. The scapula (shoulder bone) and the clavicle (collar bone) are typical in most mammals, however, some horses, pigs, deer and whales lack a clavicle. Based in Victoria, B.C., Jennifer Berube has been writing professionally since 2006. Her articles have appeared in "Zouch Magazine & Miscellany" and "Political Media Review." Berube is a graduate of the Humber College Journalism program. Berube, Jennifer. "The Skeletal System of Mammals." Sciencing, https://sciencing.com/skeletal-system-mammals-8562381.html. 25 April 2017.